We now can provide clear insights and real time metrics on how the Event extends in the social media channels, the level of engagement with exhibitors, and how the mobile apps accelerate the ROI building for Conferences and Tradeshows. Conferences and tradeshows are all about connecting people to people, and people to information, and the mobile app from Zwoor.com is amplifying the connection power. And now, is also able to provide real time insights on how much the physical event extends into virtual connections. How many attendees connected with the keynote speaker? How many connected to the tradeshow exhibitor XYZ? How many times the Wednesday 5:30 pm session was added to the personal calendar of the event attendees? For Conference and Tradeshow Planners still trying to figure out the mobile app amplifying power, and if that investment is paying off, there is good news ahead from Zwoor.com mobile app. What used to be affordable only via heavy analytics investments, and expensive correlation of data for mega-Conferences, at corresponding mega-price points, will be made available, starting mid-April, 2012 to all Conference and Tradeshows Event Planners, included in the already very affordable price points. Conference Agenda, Speaker Bio and agenda materials, Exhibitor booth description, Track descriptions were already part of the Zwoor Events mobile app functionality. In March, Zwoor.com added integration with social media from within the mobile app, for a one click way to connect people to people, and people to information, for lasting connections and engagement long after the Conference or Tradeshow ends. With the April release, the analytics engine provides real time insights on the connections made between attendees, speakers, exhibitors, and with social media channels. Attendees can now “follow” the speaker in Twitter or LinkedIn, signal their interest on participating on an agenda topic or visiting an exhibitor booth, tweet to the conference hash tag – all from within the mobile app. Native Twitter integration, and pre-filed hash tags makes it easy for attendees to share news on the event. A personalized calendar on the mobile app provides a clear journey for the conference events. And, for the Event planner, solid analytics on engagements and connections, and business opportunities created. For a Conference organizer or Meeting planner, the mobile app transforms an attendee into a lifelong fan. The built-in Twitter and LinkedIn connections create an easy, one-click networking and conversation starter. Conference Real Time Alerts allow a better engagement and messaging to attendees, from venue changes to special promotions during the show. Speakers and Attendees profile contain social media fields for easier connections, and an attendee can signal participation in the presentation, to the speaker and other attendees, for more connected presentations. A Twitter Conference wall, based on event hash tag, is fed automatically from the mobile app. Exhibitors are notified of the interest of visiting their booth, and the mobile app allows one click connections to be made. Session ratings and comments are built-in the mobile app, for real-time feedback. No more paper surveys at end of the topic. And now, the power of analytics on the connections made. The mobile applications are free to download from the iTunes store, Google Android or Amazon Android Marketplace. The subscription model for a Conference and Tradeshow can be completely free for a Board Meeting, if ad supported. 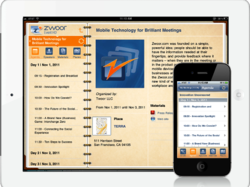 The Zwoor Event mobile app puts all Conference or Tradeshow materials, including agenda, logistics, speaker bios, meeting materials at the attendees’ fingertip, on their mobile device. Be that an iPad, iPhone, Kindle Fire or an Android tablet or phone, the content is available online or offline. Once the content is synched, all materials are contained on the tablet – no connection required, even in an airplane. Real time feedback and rating of the topic is included in each agenda item, allowing an attendee to provide instant comments directly from the mobile app. All the materials are easily uploaded by the Meeting Planner, or by the Speaker or Exhibitor directly, via a simple to use browser interface at Zwoor.com. Zwoor Event has several security formats, from Conferences and Tradeshows materials intended to be shared publicly, to a Company or department meeting restricted to the company employees, or even a very private Event with highly restricted data, where the materials distribution is tightly controlled and uniquely identified. “Zwoor.com provides to Conference and Tradeshow Meeting organizers an easy to use platform to distribute the event materials, speakers bio, event agenda and exhibitors profile to the participants’ mobile devices, be that iPads, iPhones or Android tablets. We offer an easy way to connect speakers and exhibitors to attendees, and attendees to attendees, in real time, during the event meetings, all via mobile devices. Just an engaging and focused Conference or Meeting, for brilliant business results and lasting connections. And now, we can provide clear insights and real time metrics on how the Event extends in the social media channels, the level of engagement with exhibitors, and how the mobile apps accelerate the ROI building for Conferences and Tradeshows.” said Ken Burns, External Relations, Zwoor.com. 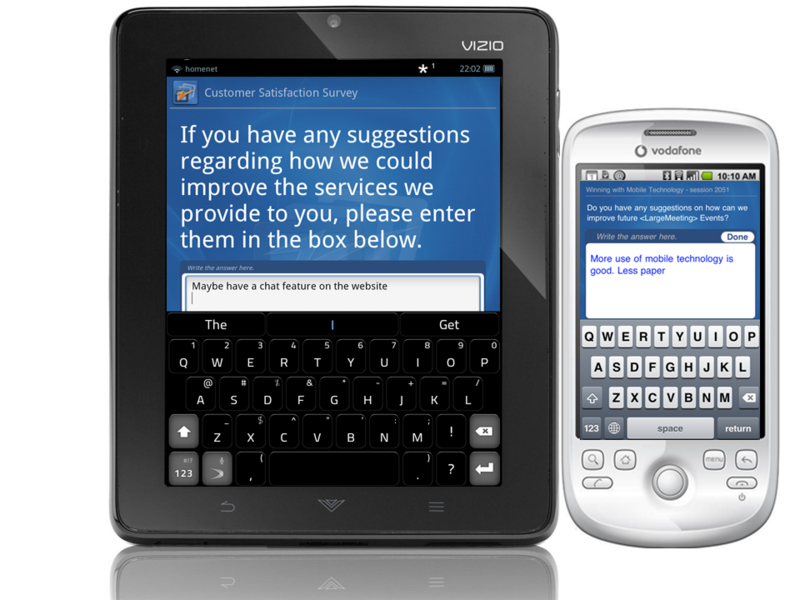 For more sophisticated surveys of the audience, the Zwoor Survey app allows the creation and distribution of surveys, online or offline. The library of templates speeds up the creation of high quality surveys, be that for capturing intent to buy during product demos, or customer satisfaction in a trade show, conference or department meeting. Real time results sharing creates dialog, and increases the relevancy of the conversation. Zwoor.com was founded on a simple, powerful idea: people should be able to have the information needed at their fingertips, and provide feedback where it matters – when they are in the meeting or in the product presentation, with their mobile devices. We want to reinvent what businesses and individuals can do through the Zwoor.com mobile platform, made for a new kind of worker, a new kind of workplace and a new kind of interactions. Learn more about Zwoor.com, how we’re changing the way people consume information, interact, provide feedback and communicate and how you can be a part of it. 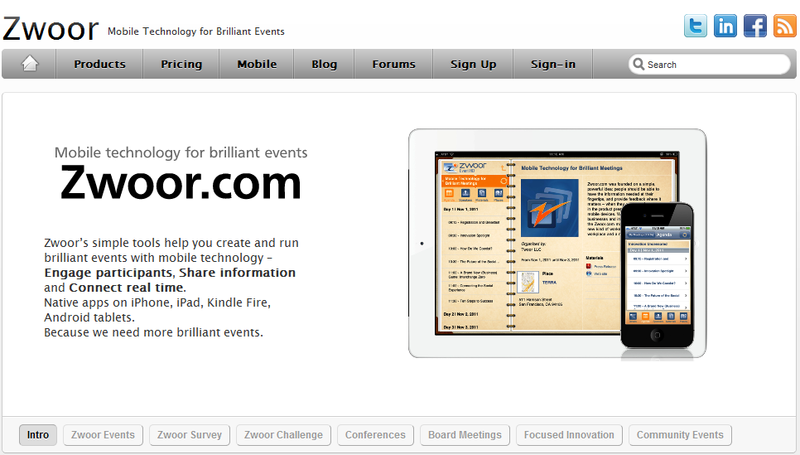 Zwoor Events - Conferences, Trade shows and Corporate events Go Mobile in just a few clicks. The attendees carry an iPhone, an iPad or an Android smartphone, and they now expect the agenda, the meeting materials, maps, exhibitors and alerts right at their fingertips. The mobile app is also used by Conference, Tradeshow or Corporate Meeting organizers. Zwoor Survey is a friendly, robust and cost effective survey platform that enables event planners to gather real insight from the event participants. Be that in a large,10,000 people keynote event with no connectivity, or in a small presentation, the mobile app can handle both. Zwoor Survey is a native application (vs. a web app), that allows timed surveys, answers to a challenge quiz for a prize, or just a simple multiple choice survey. Not dependent on the connectivity in the venue – we know that some of the spots are without cellular or wifi coverage. Idea Challenge platform helps event managers to create and run Innovation Challenges, and focus participants on solving the wicked problems the organization encounters. By incorporating powerful algorithms, tagging, recognition and engagement, the application allows all participants to enter the challenge, follow others, submit and rank ideas.